As Apple (AAPL) fans line up to snag an iPad 2 when they go on sale at 5 p.m. Friday, individual consumers won't be the only ones purchasing the tablets. According to analysts, corporate America is increasingly adopting the popular tablet computer. "The iPad is primarily sold to consumers, but Apple is trying to increase enterprise adoption," says Ashok Kumar, an analyst with Rodman & Renshaw. Indeed. Apple says that more than 80% of Fortune 100 companies have pilot projects involving the iPad or have already started deploying it widely -- up from 65% in the previous quarter. Some of the industry titans bouncing their business off the iPad include banks like JPMorgan Chase (JPM) to Wells Fargo (WFC), health care companies like Cardinal Health (CAH), retailer Sears (SHLD), and conglomerates like Archer Daniels Midland (ADM) and DuPont (DD). Apple is not only marketing its iPad to businesses, says Forrester Research analyst Ted Schadler, but over the past two years, the company has increased its focus on offering features in mobile devices that will appeal to corporate America. The iPad, for example, touts such security features as are common among virtual private networks (VPNs), as well as full device encryption and passcode support. "Apple has experience selling to government and education, but the way it addressed the corporate market had been spotty," Schadler said. "But I'm now bullish on Apple's future in the enterprise." Could 50% of iPads End Up in the Hands of Businesses? Last year, manufacturers shipped a total of 16.7 million media tablets worldwide, of which 12.8% were purchased by companies, according to ABI Research. 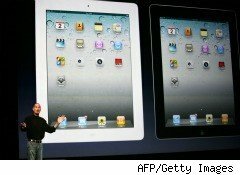 Apple's iPads made up the lion's share of those sales in 2010, given that its competitors hadn't yet fully stepped out the door with their own tablet computers until later in the year. By 2016, an expected 87.8 million tablet computers are expected to ship, and forecasters predict businesses will buy 23.5% of them. And while analysts aren't saying that business customers may one day make up a greater share of the iPad's market than individual consumers, the trend for business purchases is definitely upward, notes analyst Kumar. Currently, two-thirds of computers are in the hands of corporations, small businesses or the public sector, Kumar says. "There's no reason not to believe that the tablet ratios couldn't one day converge like that," he says. Another analyst who says "never say never," is Kevin Burden, vice president of mobile devices for ABI Research. However, Burden notes: "Most companies fall into one of two categories. They are trying to build a competitive advantage or trying to defend their competitive advantage. So if they see a lot more companies are using an iPad to be nimble, they may follow suit."